One of the coolest movies in ages, this one is both incredibly experiemental, and also fascinatingly compelling. 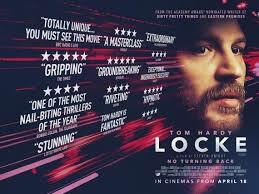 Locke is a movie so far beyond anything that has ever been put on film before that it’s truly a wonder this movie actually worked. This is taking experimental to the next level. It’s a movie that takes place entirely in one car featuring only one character, on screen, during a single car ride. That character is Ivan Locke, a man on a mission. He spends the duration of the film taking the most life-changing ride of his life. That’s because there are tons of conflicts just waiting to come out with each new phonecall he makes. Locke has secrets and disappointment that he has been sitting on, for quite some time. Now, during this car ride, his hand has been forced, and he needs to let it all out. What unfolds is a series of events and discoveries that are all handled through lively and energetic conversations. This is a movie that does everything right. That includes having an incredibly interesting character, with Ivan Locke, and a storyline that is all about taking this man on a revelatory journey. Tom Hardy is brilliant during this sort of one-man show. 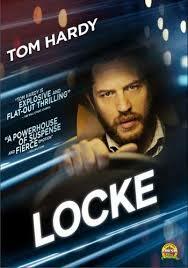 Locke is one of the absolute coolest movies around. It’s a movie that is smart and innovative as well as completely captivating. This movie pulls something off that one might think would be impossible. It gives us a story that takes place entirely in one car during a single ride. There’s also only one character on screen for the entire film. The last time they tried something like this was the movie Buried, with Ryan Reynolds, and that movie didn’t work. There weren’t enough plot threads or different characters for him to speak to on the phone. Locke ups the ante and gets it right. This is a movie that takes experimental to the next level. Seeing a film that features only one character on screen for it’s entire duration is a little bit like watching a one man show. It’s Cast Away or Gravity or Moon, only without the other characters at the beginning and end. And also, unlike those movies, here the setting never changes. Ivan Locke (Tom Hardy,) never even leaves his car. Not for gas or anything. The story has it that Ivan Locke is driving away from a construction site on the night of the biggest pour in European history. His company, which he has worked for during the past nine years, is about to take it’s biggest risk and absolutely everything is on the line. There’s no calling it off, or turning back from this point, and yet Locke is leaving the job and driving away. He’s not quitting, he just has somewhere he needs to be that takes precedence. As a man of principle, he still wants to ensure that the job goes well, even after he has been fired. Locke doesn’t care. He still considers this his building. The reason why he’s leaving the job has nothing to do with anger or any ill will. Instead, Locke is leaving for a woman. Sounds corny right? It gets better. You see, this is not a woman he loves or even really cares about at all. In fact, throughout the movie, he repeatedly tells her over the phone that he does not love her and doesn’t even really know her. He makes it very clear to her exactly where he stands on their relationship, and that he is happily married to someone else. The reason why he’s leaving the site to be with this woman, Bethan, is because she is having his child. Bethan is pregnant from a one night stand she had with Locke, while they were out on a job somewhere. She is apparently a very sad and lonely person with only the slightest bit of happiness in her life. Bethan is an older woman who is not that pleasing to the eye, and we know all this because Locke describes her that way to different people he speaks with on the phone. When the movie begins, we learn pretty quickly that Locke has not yet told his wife about Bethan. Than we get to witness that phonecall for ourselves. Other movies might have shyed away from it and let that actual moment play out off screen with us only witnessing the aftermath of it. This movie refuses to shy away from anything. It has created a situation where leaving important moments off screen is not in the realm of possibility, and so we not only see Locke’s phonecall to his wife, but also the calls he makes to the men at his construction company who are just getting the news that their head foreman is leaving the job. It’s an incredible amount of conflict built into one movie. There’s a point toward the end where Locke says over the phone that at the start of the night he had a job, a wife, and a home and now he has none of those things. We can look at it like at the start of the movie, that’s what he had. I love lines like this, which sum up everything the character has been through during the course of the movie. Still, conflict is one thing, but it’s hardly enough to sustain us for the duration of the film. The movie comes up with plenty of other ways to do that. The movie goes back and forth between conversations with Locke and his wife, Bethan, Donal (Locke’s assistant), and Gareth (his boss.) Locke has convinced Donal to not answer Gareth’s calls and that Locke, himself, will walk Donal through everything he needs to do. The amazing thing is that he is trying to balance out this delicate work situation with the delicate situation of his life and loved ones. Those include not only his wife, but also his two sons. and to give us even more, the movie gets pretty deep in explaining why Locke feels the way he does about being there for the baby. This all relates to Locke’s own backstory that he had with his father and abandonment. What we’re looking at is some truly poetic stuff. There’s no question that the car and the drive are metaphors, but even without looking at it that way, and having to figure out what everyting means, this is a pretty incredible film.